My coworkers raved about these muffins! "Like fresh marmalade," said one. "Very orangey, surprisingly orangey," said another. I had to let them in on the secret: the recipe calls for an entire orange (pureed) to be added to the batter, peel and all. Make sure the orange is completely liquified, as you don't want to bite into any huge chunks of unpureed peel. 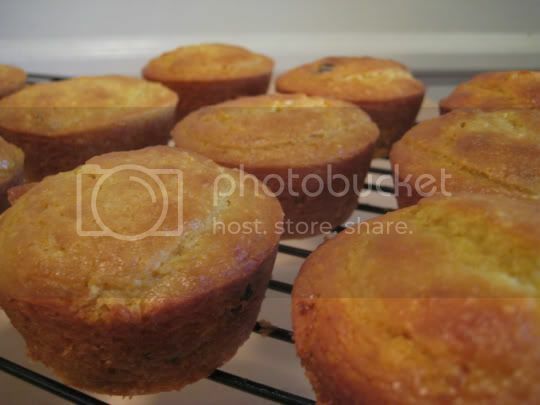 These muffins also took a whole stick of butter, so they are rich and super moist. They were great for leftovers, but they definitely need to be refrigerated (and then brought to room temperature to enjoy). They remained soft, sticky, and sweet. The raisins were a nice addition, but maybe not entirely necessary. Dried cranberries would substitute very nicely, and could even take away from some of the sweetness. Make again? Yes. Instead of raisins, try dried cranberries, maybe even semisweet chocolate chips, or nothing at all. The strong orange flavor is enough on its own. I enjoyed this muffin. I think it would really be good warm with butter. It is something that I could eat with my salads. Yum! These were soooooooooo good! I can't wait to make them myself! !